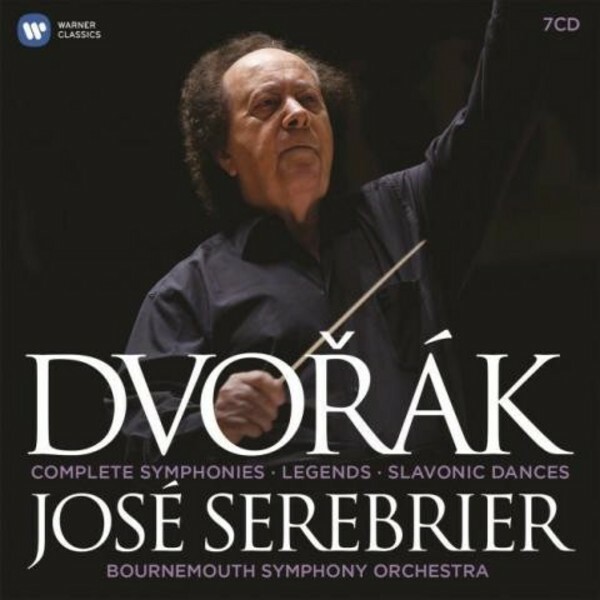 One of the most recorded conductors of his generation, José Serebrier here completes his much lauded survey of Dvořák's symphonies, adding Nos 1, 4 and 5 to a series of Bournemouth Symphony Orchestra performances that have been praised for their considerable expressivity, remarkable handling of detail and supreme orchestral balance. The works are accompanied by a variety of other concert pieces, among which are a selection of Dvořák's lively, nationalist-driven Slavonic Dances as well as the wonderfully lyrical Legends, endearing miniature tone poems which reveal the Czech composer's mastery of the shortest forms. ‘When it comes to conducting Dvořák, José Serebrier isn't afraid to get mud on his boots,’ declared Gramophone magazine of the legendary maestro. An eight-time Grammy winner with more than 300 releases to his discography, Serebrier has a special affinity for Slavic music. But until recently he had recorded only two symphonies by Antonín Dvořák, Nos 8 and 9. This has been remedied with a newly recorded Complete Symphonies Cycle with the Bournemouth Symphony Orchestra. The Dvořák project began with three individual CD releases: symphonies 7, 8 and 9, each coupled with shorter evocative tone poems and dances. The cycle has gone on to garner rave reviews: ‘Serebrier's balance of the varying instrumental tapestries is well-nigh ideal: it is impossible to imagine a finer account of the work than this... The recording quality is simply flawless.’ (Symphonies 2-3, International Record Review). In the booklet notes, Maestro Serebrier explains that Dvořák’s Symphony No.1 ‘The Bells of Zlonice‘ was composed for a competition in early 1865 but the score was never returned to the composer and he never heard it performed. It was re-discovered in 1923 and given its premiere in 1936. Serebrier, convinced of “some glaring harmonic errors in the last movement”, consulted with music publishers, musicologists and historians, and with the Dvořák manuscript library in Prague, before correcting these. He believes Dvořák would have done the same had he heard the work. The conductor and composer José Serebrier was born in Montevideo, Uruguay in 1938 and studied at the Curtis Institute of Music with Antal Doráti and Pierre Monteux. The great Leopold Stokowski, who premiered Serebrier’s First Symphony and took him on as Associate Conductor at the American Symphony Orchestra, hailed his young protégé as “the greatest master of orchestral balance”.